(Nanowerk News) Grafen Co. (Turkey) and LUM GmbH (Germany) have started a joint research on water-based colloidal exfoliation processes to produce graphene nanoplatelets in bulk scale. The novel method, liquid phase direct chemical exfoliation, enables industrial manufacturing of graphene with a green approach at low cost. The research has already completed initial phase giving strong results, and future plans call for larger work to gain technological understanding. “We look forward to working together with LUM GmbH” said Ibrahim Mutlay, Founder and Chief Science Officer of Grafen Co., “deep expertise and knowledge of LUM GmbH in colloidal chemistry, physics and characterization of liquid suspensions, emulsions and other complex liquids perfectly complement decade-long experience of Grafen Co. in carbon nanomaterials”. Fig. 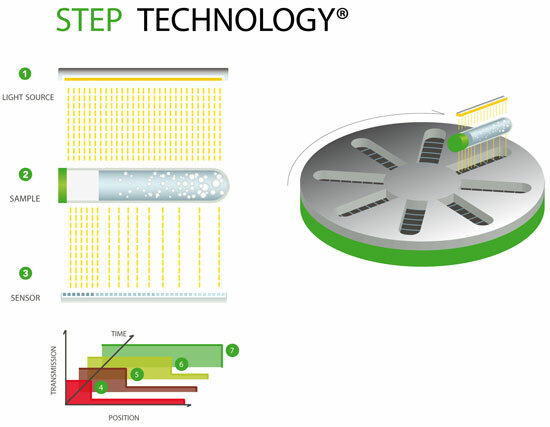 1: STEP-Technology® from LUM GmbH. Liquid phase direct chemical exfoliation is a promising research direction in the field of graphene production aiming direct conversion of large volumes of raw graphite powder into the final graphene product with nearly pristine crystal structure and physical properties unlike any other graphene synthesis techniques. Usually organic solvents like N-Methylpyrrolidone (NMP) are employed as exfoliation media in this field however Grafen Co. chooses aqueous surfactant solutions specifically targeting to avoid toxicity of those organic solvents. As part of the collaboration, LUM GmbH shares its expertise in colloidal stability of complex fluids to evaluate the graphene production processes developed by Grafen Co. Stability of graphene suspensions is characterized by cutting-edge LUMiSizer® systems from LUM GmbH. LUMiSizer® using STEP-Technology® (See Fig. 1) is an industry standard for consistent and fast determination of stability of colloids. Traditionally, stability analysis of graphene suspensions to decide best formulations for exfoliation is a difficult and time-consuming work however LUMiSizer® allows extremely rapid implementation of the experiments. Initial phase research on time-dependent sedimentation velocity of graphene nanoplatelets in aqueous surfactant solutions unveils best surfactant types for bulk production (See Fig. 2). Clearly graphene has a tendency to being more stable in nonionic surfactants that is in agreement with the scientific literature. Those findings will guide the direction of next step in this research collaboration. Colloidal stability may also provide new insights into graphene exfoliation mechanism in liquids and help to improve industrial manufacturing technology. Fig. 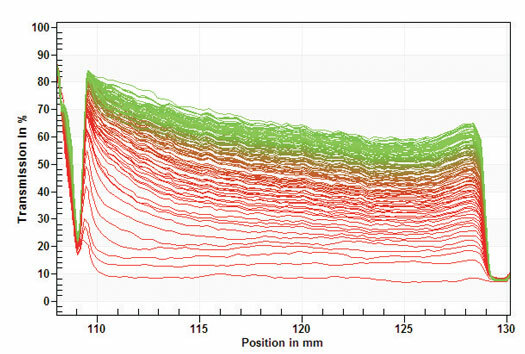 2: Sedimentation velocity of graphene suspensions developed by Grafen Co. Left, transmission profile of the graphene suspension in Tween 80 solution, 2 hours centrifugation at 36 g 20°C (every 10th profile displayed, red – first profiles, green – last profiles). Grafen Co. was founded by Ibrahim Mutlay 10+ years ago to develop carbon nanotube based fibers. After extensive R&D in this field to build pilot-scale carbon nanotube development lines, Grafen Co. expanded its research directions into the immature graphene technology at 2007. Today, Grafen Co. with its skilled Executive and International Advisory Boards is a major technology developer in the field of advanced material sciences involving not only carbon nanostructures but also natural and man-made nanomaterials, functional polymers and fine chemicals. Grafen Co. is headquartered in Ankara, Turkey. The LUM GmbH is one of the leading producers for analytical devices for dispersion analysis and particle characterization. With the award-winning Adhesion Analyser LUMiFrac LUM entered in 2012 the field of materials testing, too. On the basis of longtime experiences in the field of fluid mechanics, rheology and colloid chemistry the company, founded by Prof. Dr. D. Lerche in 1994, has developed the innovative STEP-Technology®, which is the technical platform for different product lines. The produced measuring equipment is used for the fast, reliable and comprehensive characterization of any demixing phenomena in dispersions. The innovative devices are part of standard laboratory equipment in leading international companies of chemical, food, cosmetics and pharmaceutical industries. Due to an effective network with national and international partners, latest research results are transformed into the present products and commercialized as new applications and devices. The portfolio is continuously extended. LUM GmbH offers a wide range of contract research and analysis in the competence fields, too. The innovative strength of LUM and its staff is documented in many applied and granted patents as well as in reviewed international scientific publications. In December 2004, the LUM Corporation was founded in Boston, MA, USA, as LUM's own subsidiary. LUM Corporation is responsible for the sales in the NAFTA-region and is now located in Boulder, Colorado, USA. The global LUM-sales network covering approximately 40 countries at present is still expanding. LUM GmbH is headquartered in Berlin, Germany.